Lantana, an exotic obnoxious weed, which is infesting around 185000 hectare of forest land in Shiwalik hills is not only posing threat to the forest wealth but also reducing the productivity status of land thereby affecting livelihood of the people. The grave problem has sounded alarms to the concerned agencies of the State Government to treat the area occupied by the wild species on priority. 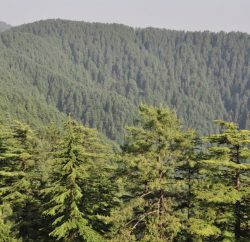 Foreseeing the peril being caused to cultivable land and forest areas due to this weed, particularly in the lower belts of Himachal Pradesh, the Forest Department, has decided to do away with the problem by resorting to planting fruit bearing and other eco-friendly species of plants on 5000 hectare of land being infested by Lantana. Apart from this a decision has been taken by the present Government to conduct massive afforestation drive by planting medicinal and broad leave plants which could serve the purpose of Food, Fodder and Fuel for the habitants of the area besides the nomads as Gujjar and Gaddis. Not only the Department has geared itself for treating this dreaded sprawling weed under Compensatory Afforestation Fund Management and Planning Authority of India (CAMPA), Green India Mission Fund of Government of India and partially under MNREGA funds but also Participatory Forest Management Committees comprising of the local population are being involved to control the spread of Lantana. The present Government is stressing on awareness of the people on environmental services of the forests. Moreover, a target has been fixed to bring 20000 hectare of uncultivable land under afforestation. Out of total geographical area of the State i.e. 55,673 square kilometers, 37033 sq. km, 66.52% is legally classified as forests. 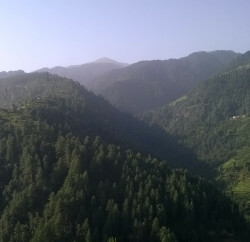 Besides, as per the forest Survey of India Report, 2011, the state has an area of 3,224 sq. Kms under very dense forests, 6,381 sq Kms under moderately dense forests and 5,074 sq Kms under open forests. While rest areas comprises of shrubs and barren land etc. Besides, an area off 10385 Sq Kms has been covered through plantation activity till 2011-12. Due to concerted efforts of Forest Department in the direction of Afforestation, the State has witnessed enhancement in forest cover from 11780 Sq. Kms in 1991 to 14679 Kms in 2011, thus resulting in an increase of 2899 square Kms forest cover in the State. As per forest survey of India report an increase of 11 square kilometres has been noticed since 2009. Apart from this approximately 3000 hectares of forest area is treated for soil and water conservation under various State Plan Schemes. There is a provision to treat 15000 hectares of forest land during next five years plan. The government has decided to fill as many as 205 posts of forest Guards to conserve & protect the forest wealth of the State and a provision of rupees 422 crore has been made for the year 2013-14 for the forest department out of which rupees 132.32 crore has been earmarked for conservation of forests and wild life which is five crore more than the previous year’s allocation. The present Government is taking necessary measures for sustainable management of natural resources and wild life outside Protected Area Network (PAN) and to conserve wildlife in Western Himalayan habitats and to manage man-wildlife interface outside PAN. With concerted efforts of the State Government, Hon’ble Supreme Court has given green signal to de-notify the proposed excluded areas out of wild life sanctuaries. Accordingly, 775 villages will be taken out of the Protected Area Network thereby benefitting more than one lakh population. Further, a Working Group Committee has been constituted to recommend strategies for the 12th Plan to increase, conserve and protect forest wealth. Approximately, 80,000 hectares would be afforested during the next five years. Besides, forest department has decided to plant 45 lakhs medicinal plants throughout the State during this financial year. The forest department has formulated a policy for Training and Capacity Building, to introduce bio-engineering measures in catchment areas, to involve private sector in afforestation, re-afforestation of scrub areas etc.